Many many years ago, I rode a No Frills ride and yes, it was definitely No Frills. We got one bowl of soup for dinner. No crackers, no bread, no dessert. Yeah. 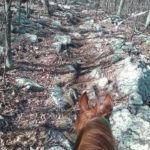 And, my horse found a rock, at the peak of the big loop, so I had to hand walk him back to the camp, which was about 8 miles. Yeah. And, they lost my hold bag after the ride. In that bag was over $100 of tack, not to mention all the other things. So, I made up my mind never to do a No Frills ride again. Then, two years ago, Lindsey talked me into the No Frills ride. She was riding on Steel. In that away hold, which is small and cramped and on a hill, Steel kicked a rider in the leg and caused her an injury. Then, one mile from the finish, Steel caught some karma and banged her leg on something. When we got into the finish, her leg was bleeding, swollen and was off so she didn’t get a completion. Yeah. I made up my mind never to do a No Frills ride again. This year is not starting well. Rabbit Run Endurance and Bunny Hop CTR both cancelled due to snow. I was going to do the Chesapeake CTR, but my truck blew up and I could not find a ride for me and Penny Pony. I even thought about stealing my neighbor’s truck in the middle of the night to go to the ride. As it turns out, they had the nicest weather at that ride. And I missed it. I buried my old truck and bought a new truck. Everything about it is awesome. I am itching to ride, and itching to take my new truck on a trip so I decided that I would bite the bullet and attend my “hated” ride, The Foxcatcher. (NOTE: To date, Foxcatcher 5, Dodie 0) However, coming into the ride date, the weathermen were predicting a 6+ inch snow storm on the day of the ride. Okay, riding in the snow can be cool, but getting out of the Foxcatcher fields the day after might not be so easy. AND, I have had very bad luck on that course when it’s just wet from rain, I could not imagine how it would be with snow covering. I spit the bullet out and chose not to go. And again, they had the nicest weather ever. The snow all passed south of us and at the ride the sun was shining and it was a crisp 55 degrees. Okay. I sent in my entry and asked around for someone to ride with me. Sonja, having no clue that she would now be the highlight of my ride story, chose to ride with me. (Thank you, Sonja!) We had some conversations about my ride strategy, which mostly involves looking at the scenery and letting Penny Pony pick a pace that doesn’t kill her. Then Cindy and I had conversation and she said she would “wingman” me down there. YAY! Although I’ll be alone in my truck, I won’t be alone on the highway. Trip down had no excitement. Other than my bladder telling me I really needed to pull over and empty it. And camp setup quickly, even though it was a wind tunnel where we were parked. It was bright and sunny and windy. I got chapped cheeks. It was supposed to get pretty cold at night, but the ride day temps were predicted to be 64 and sunny. NO WIND. I woke up and threw back the covers. Okay, let me stay under these covers a bit longer. It is cold. My phone said 23 degrees. I started my truck and climbed in to warm up and it said 22 degrees. I layered up some clothing and get going with my horsie chores. Sonja wasn’t up yet so Penny Pony was eating her mash and telling Blossom, “Na na na na na” Cindy was getting ready to go on the 50 mile ride and I knew that Penny Pony was going to get mad as hell when Bailey left. Oh yeah, let the airs above ground begin. Why yes, yes she is a basket case before we go out. Why yes, yes she is a monster under saddle and has never..not once..given a buck or a rear or a spook. once I hit that saddle, she is all business. ALL BUSINESS! Even Sonja gave me the wide eye look after watching Penny Pony in her corral. Then we tack up and get on. And we did. By the time we reached the 9 mile 10 minute trot out, we had passed 12 riders. So far, Blossom was doing fine with Penny’s pace. They both ate and drank a little then we hit the real trail. This photo is us leaving from the 10 minute hold. Penny didn’t really wake up until we had that little break. Now Sonja and Blossom are going to feel the burn! Penny Pony was looking 30 miles down trail the entire time. I kept checking on Sonja, and she kept on smiling. One thing I will give the OD rides. The views are outstanding, breath taking, and I absolutely feel like I am on top of the world. It can be a little daunting to some people to be walking along a ridge a thousand feet up on the edge of a mountain and being able to look straight down the side to the bottom. But I love it. .On trail, Penny Pony stopped at every water crossing and tanked up. I told Sonja, she has always been, from day 1, a great drinker on trail. She will eat, too, when there’s something other than rocks available. And rocks. Lots and lots of rocks. 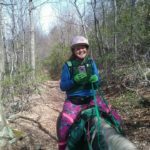 I did discover last year at the OD ride that Penny Pony is a rock trotting machine. So, I let her pick the pace through the rocks. A couple times I had to ask her to slow it down, but mostly she trotted when she could and she walked (all on her own) when she couldn’t. So, little story here. When we started on the Blue loop. I kept feeling like we were going wrong. We passed LeeAnne and she said we were going correctly, but it felt wrong. Then we passed a left turn, but the pie plate said “55”. We did not notice the “& 30” written in smaller letters at the bottom of the pie plate. So we kept going and now Sonja says it feels wrong. We only went a half mile past the turn. Then a half mile back to the turn so we got in an extra mile of workout. Penny Pony was setting a mean pace, we passed a couple more riders. Then we passed some drag riders. 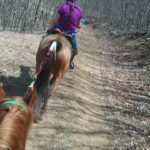 We came out onto the downhill single track leading into the vet check and Penny Pony picked up the pace. Sonja was already far outside her comfort zone traveling as fast as she and Blossom were to stay with Penny Pony, so that downhill pace was too much. We slowed down. I had made her promise me before we started that if it was too much, to tell me. I was there for the fun, not for the win. She held to her promise! Then we picked up a new rider on a new horse. 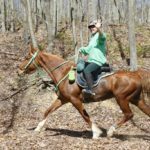 Allison was so grateful to be able to join us because her horse, fondly known as Monster, was sure he was all alone on the trail and he was never going to see another horse again. .We came out on the grassy pathway and Penny Pony kicked it up a notch. She knew we were heading back and I was hard pressed to keep her at a “group” pace. She was cantering, and her ears were forwards and she was happy happy happy. I did convince her to walk the last 1/2 mile into the vet check. Into the hold we go. Penny Pony vets in with all As and one B. Her CRI was a bit elevated (60/64), but she was hot, I did not sponge her and the sun was beating on us waiting in line to vet in. I wasn’t concerned. Some person untied Penny Pony from the bale of hay and was holding her down hill. No hay, no water. I quick run over and grab her from that person. I saw Sonja and Blossom way up the hill from me and debated taking her over to be with her riding buddy, but decided since the hold wasn’t crowded, I would keep her where my bag was so I didn’t have to lug it up the hill. I walk over to my bag and tie her in the brush, off to the side, to a small tree, throw hay in front of her, and now she is eating everything in sight. Still no volunteers to help me out so I grab a bucket I see laying on it’s side and I walk down and fill it with water. Now she’s drinking. I pull her pan and grain from the hold bag and she’s REALLY happy now! I sit under her and eat my peanut butter and jelly sandwich. 30 mile riders are starting to pile into the hold now. It’s beginning to fill up so I throw Penny’s saddle on her and get ready to roll. We still have 15 minutes until we leave, but I don’t want to be saddling up when horses are milling around. She’s eating and happy happy happy because she has discovered I put carrots in her bowl. Yes, I alctually remembered to put carrots in the hold bag. I almost forgot! Okay, now the front runner 50 mile riders are coming in and the hold is really getting crowded now. I pull Penny deeper into the brush and tie her to a different tree, away from the commotion, so I can go pee and be ready to go. I looked for a volunteer to hold her and didn’t see one. “WHACK” then some rider yelling at her horse. Penny’s head came up out of her bowl, her eyes were big as saucers then she grunted and her front legs started to crumple. My body was reacting before my brain understood what happened. 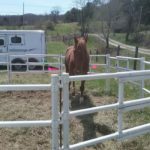 I grabbed the billet straps, dropped the saddle on the ground and dragged her away from the brush and out into the open. She dropped like a stone to the ground and rolled on her side, groaning and quivering. Yes, two mares were fighting at each other and Penny Pony was the one that got kicked. I hear people in the back ground yelling for the vet. I hear people saying colic, get her up. But someone grabbed the reins from my hand and pulled her up. I grabbed them back from that someone and started down the hill to see the vet. She is really in pain and maybe something is broken. I’m trying to say, “She got kicked.” but nothing is coming out as I’m trying to keep up with the vet’s 300 mph jog. All I can do is shake my head, “No!” and hope the vet is seeing that. Now the vet is frantic that she has internal bleeding. Dale was checking her over and found the spot where she was kicked. 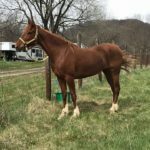 A huge hematoma, the size of a perfect horse hoof, was rising on her right side, right behind the rib cage in the soft tissue of the belly. He started a massage. 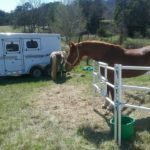 Actually, by the time we got all the way down to the vet truck, Penny Pony was looking and feeling much better. Now she’s trying to eat the grass growing on the side of the road. 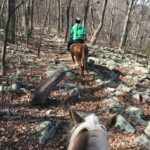 Here comes Sonja and Blossom leaving on trail and I’m trying to tell her what happened, Dale is telling me to calm down because I’m getting Penny all worked up and the vet is asking me if I am going to continue the ride. No, I am not taking this mare back out on trail with a huge hematoma. Yes, you can give her banamine. No, I am not leaving this hold without my saddle, and stuff. Yes, it is on the hill. Thank you Dale for walking up there to get it for me. And I get a hot flash. Dale trailered us back to the base camp. Penny got off the trailer at the treatment vet and while he’s trying to look at her, she’s consuming everything in sight. He told me that best thing for her would be to take her home and let her in her pasture to keep moving. Better than staying in a small corral all night and possibly cramping up. Dang. I wanted to do the bonfire and I even brought my banjo. I practiced and everything before coming because I knew there was going to be a bonfire. Oh well. Treatment vet said she’d be fine. She ate and drank everything I put in front of her. So after waiting two hours to be sure nothing was bad wrong, we packed up and left No Frills. This is her 1- minutes before loading up to come home. She doesn’t even look like she did 23 + 1 miles of tough mountain climbing through rocks, let alone got kicked and had a huge hematoma pop up. Penny is fine! By Friday the hematoma was mostly gone. I am (however) not going to do Cheshire this weekend. And that makes me sad because Cheshire is my all time favorite ride. I just don’t think it is fair to ask her to go compete the weekend following a blow-out kick in the gut. I’ll take her for a nice 10 mile conditioning ride and be happy that she’s okay! And by the way. I love love love my new truck. Come find me at a ride and check it out. It is awesome.